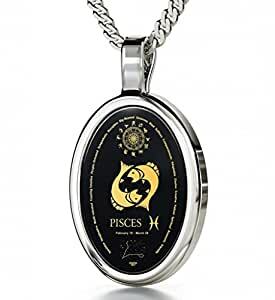 Pisces pendant necklace with the fish star sign, symbol, constellation and personality traits intricately inscribed in 24k gold onto an oval black onyx stone, 0.6x0.9 inches, set in a 925 sterling silver cameo style frame measuring 0.65x1.15 inches, including the bail. 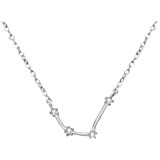 The celestial zodiac necklace arrives on an 18 inches, 45cm, high quality, traditional Italian made 925 sterling silver curb chain. 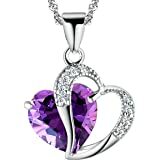 The beautiful unique pendant arrives in a jewelry gift box, ready for gift giving or receiving. 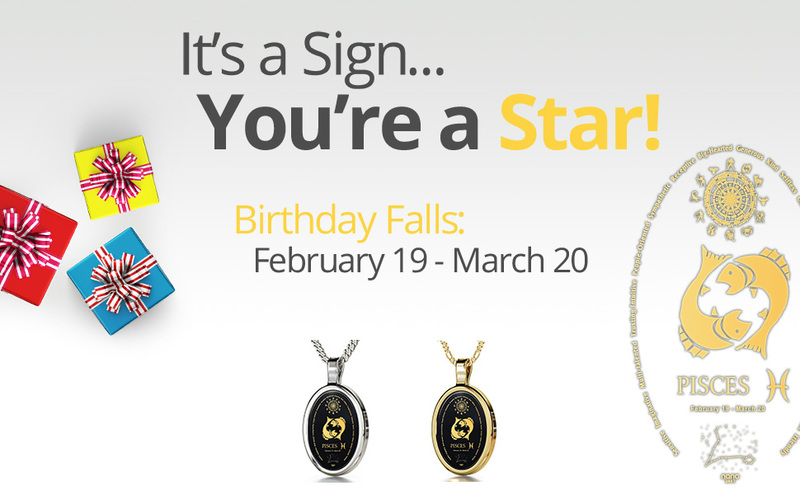 The twelfth astrological sign in the zodiac chart, Pisces falls between the dates and months, 19th February and 20th March. 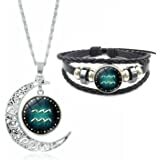 Celebrate your individuality or give this jewelry as a perfect surprise present for astrology lovers. 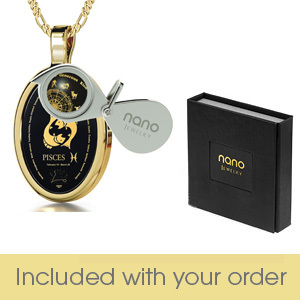 Nano jewelry is uniquely inscribed in 24k gold using innovative 'never seen before' technology, allowing us to place a labyrinth of miniature text and intricate detail over the surface of small stones, sometimes only visible with the help of a magnifying glass, included with your order. 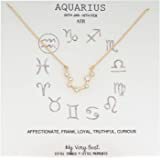 Our fine zodiac jewelry makes the prefect birthday gift idea or a wonderful gift for any occasion, whether it be Christmas, a wedding anniversary gift or a simple thank you gesture. 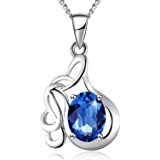 Sold by NanoStyle Jewelry and Fulfilled by Amazon. Gift-wrap available. 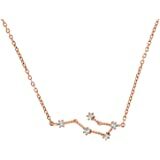 PAVOI 14K Gold Plated Astrology Constellation Horoscope Zodiac Necklace 16-18"
The World's Only 24k Gold Inscribed Jewelry! For the first time ever, a unique, technologically advanced method allows us to inscribe beautiful detail in 24k gold. 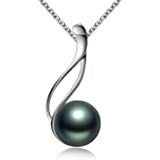 Looking for the perfect birthday gift idea for her? 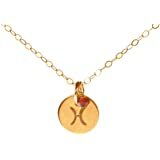 Presenting her with a unique zodiac necklace imprinted in 24k gold should do the trick. 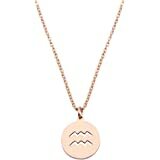 Show the Pisces in your life you have an eye for detail, with our enticing, unique zodiac jewelry collection. 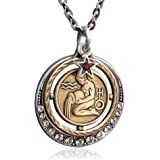 Celebrate your month of birth or give that special someone the perfect gift of a zodiac necklace to accent their unique elements. The concept. 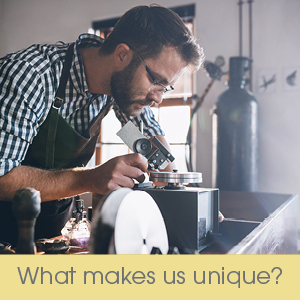 The design stage is just the beginning of the journey, ideas and dreams are fashioned into imprinted minuscule designs and then rendered onto our high-tech machinery which carefully inscribes the 24k gold onto the small stones. The handicraft. Each piece is made to precision and individually handcrafted into the final item. 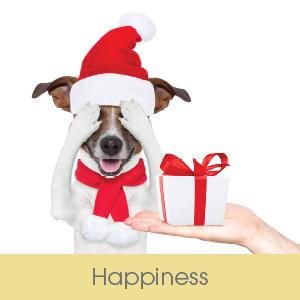 Your happiness is what matters to us! 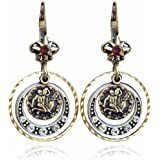 We're sure you'll be completely happy with the jewelry, in the event that anything should arise, let us know and we'll make it right, no matter the reason. 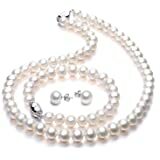 All our jewelry is made using the highest quality materials. We inspect each piece individually before it leaves our caring hands. 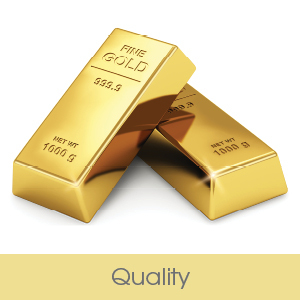 We are committed to providing and ensuring the highest quality materials are used, never compromising on standards. All our precious metal options are hallmarked. All our raw materials are sourced ethically and our manufacturing and crafting procedures ensure the finest result is achieved time and time again. 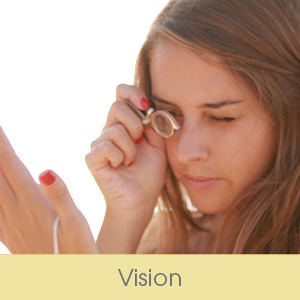 Yes, the text is small, it may even be smaller than the naked eye can see. That’s why we engineered a mini magnifying glass for you to discover every intricate detail. Simply hold the magnifying glass close enough so that your hand brushes your cheek, then maneuver the pendant until it comes into focus through the magnifying glass (approx. 3-5 inches away) and your set to admire the inscription. Play around with the distance if you're not finding the focus. We promise you'll get there! Disappointed - was excited to buy this for my daughter for Christmas. 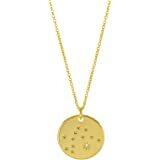 Just received it - This necklace is so tiny you can't read it even with the magnifying glass. 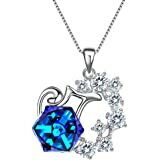 The pictures of the necklace make it look so substantial that you feel it is worth the investment until you see it - nowhere near the appearance of the pictures. Nice packaging but just not the look I was expecting given the price. Sending it back.